The most successful Realtors seem to be the ones that really love marketing themselves and their business. Those Realtors get leads. Those leads convert to clients. They close more deals. You know who those real estate agents are in your community that seem to be marketing geniuses. They probably really like the marketing side of being a Realtor, and it makes it easier to to like something when you’re good at it and vice versa. It might not be obvious, but there are some parts of the job that those same successful marketing mavens really dislike, or that they just don’t have time to do themselves. Maybe they dislike paperwork. But they can hire an admin to help them. Maybe they don’t like showing properties. So they can work with a partner or hire a buyer’s agent to show houses. Those Realtors get their job done by outsourcing the tasks that they don’t have the time or the interest in doing themselves. Many Realtors don’t prioritize marketing their business, and there are even more who really dislike marketing completely. The sending of direct mail, the working the room at networking meetings, and the writing of their blog on their website. These are chores that Realtors wish were not in their job description, but are a necessary evil. Most marketing tasks can be outsourced. Look at your marketing strategy, and you will find many tasks that you already outsource yourself. Real estate signs showing that a house is for sale. The manufacturing of the sign was outsourced. Chances are, part of the design was outsourced to the sign maker as well. Postcards that are sent to prospects. The printing and mailing of the postcards was outsourced. Chances are, the design was outsourced to the printer as well. Direct mail letters that are sent to leads. The printing, stuffing letters in envelops, and mailing of these letters is sometimes outsourced. Business cards that are handed out to everyone with a pulse. The printing of the business cards was outsourced. Chances are, the design was outsourced to the printer as well. Tchotchkes that are given away at open houses and other events. The manufacturing and printing the Realtors logo on the give-away was outsourced. Gifts that are sent for holidays, special occasions of your clients, or after a closing. Adding your logo and the shipping may have been outsourced. So yes, marketing can be outsourced. Marketing is already being outsourced. Realtors don’t have the capability to do everything. A business website is one of the most valuable and professional ways that a Realtor can market themselves. And Realtors know this, but it’s difficult to know how to start building a website. Why not outsource your website? Hiring a company to build your website is no different than hiring a company to manufacture your signs, or hiring a company to print your postcards. A quality website development company will do so much more than just build a website. They will be able to include the necessary backend SEO work so that your website can get discovered more easily by search engines like Google. They can guide you with a strategy to promote the website to your database. They can give you guidance on your brand, and how to use your website to complement your brand. They can give you templates for creating website content. Some can even write all the content for you. What is website content? Website content is a blog, the website’s community pages, the about me page, and other pages on the website that has, well, content. Realtors can enhance their marketing tactics by repurposing that website content onto their social media channels, such as Facebook, Twitter, Pinterest, and more. Posting information that your potential leads and clients would find valuable on any channel is content marketing, which is a form of inbound marketing. Content marketing is critical for helping your website get discovered by potential leads via search engines. Outsourcing your website, rather than trying to build it yourself, will save you time. That time translates into opportunity cost. It will also ensure that your website is built correctly and built well. And the website will give you the ability to write content for your blog. Although most real estate agents have good intentions of writing a blog, most Realtors never do. In fact, 88% of Realtors don’t even have a blog, according the the National Association of Realtor 2015 Real Estate in the Digital Age. The good news for those Realtors is that content writing can be outsourced too. Just like most marketing tasks, there are companies that will write blog posts for Realtor websites. But finding the right company to write content for your website blog can be challenging. The old phrase “you get what you pay for” is especially true for companies that sell blogging services. Many companies advertise very inexpensive blogging services to real estate agents. These companies will sell the same generic real estate content to every agent who subscribes to their service. Why is this bad? One thing is that the content isn’t personalized for your clients or the areas you serve, so it doesn’t provide any type of value. Why pay for something that doesn’t provide value? The other drawback is that Google knows that the same content is on many different websites (i.e. every other Realtor who subscribes to that same service), and Google doesn’t like this. So Google won’t even rank the website for that content, and some qualified sources, like Hubspot, claim that Google will even penalize websites with duplicated content. Realtors don’t have time or even the capability to create all the tools to market themselves in every way that they need to. Realtors can’t build their own signs without buying machines to make them. Realtors can’t print their own postcards without learning design software and buying a specialized printer. And Realtors can’t make their own websites without spending valuable time learning how to start, how to do it, and then actually building it. 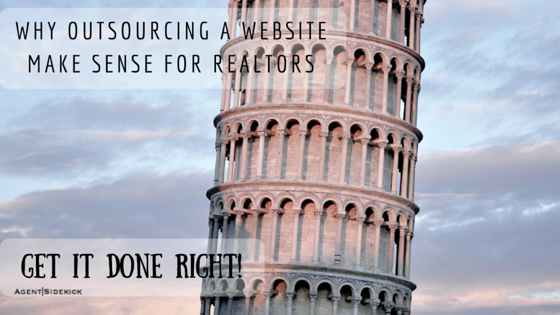 Fortunately for Realtors, most tasks can be outsourced. Of course, everything comes with a price, but the Realtor should understand what the return on their investment would be. If the marketing strategy brings in one closing, does that closing pay for the marketing effort? If so, then any additional closings that marketing strategy led to would be gravy. Websites are important for any business. A business without a website looks unprofessional. And a website provides the ability for inbound marketing by means of a blog. The writing of a blog can be outsourced as well, but only if done carefully. Realtors with websites that have a well written and consistently published blog tend to be successful. Take some time to look at your market to see which real estate agents are doing this well. You might not know it, but those marketing mavens we talked about early probably outsourced their website too. If you are interested in learning how Agent Sidekick can build a website for you, feel free to take a Product Tour, or contact us to set up a Free Consultation.